Everyone appreciates a great smile, after all, that’s what we show the world. It affects our self-esteem and ability to socialize. But those pearly whites are not just for show, and many of us underestimate the impact teeth have on our overall health and nutrition, and vice versa. 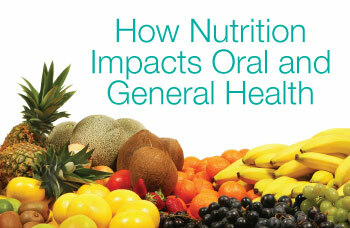 nutritionally adequate diet is essential for oral and general health maintenance — throughout life. While teeth develop with a strong and protective outer coating of enamel, they are not immune to the ravages of disease and wear. Tooth decay is one of the most common diseases known to man and is responsible for untold pain, suffering, and tooth loss. Diet plays a major role in tooth development, dental caries (tooth decay), dental (acid) erosion, and even wear. What’s more, scientific evidence overwhelmingly proves that the same sugars that cause dental decay also contribute to obesity and metabolic syndrome — the leading cause of death in the US and first world countries. Deciduous (baby) teeth are most susceptible to decay soon after they erupt from 3-6 months of age, as are permanent (adult) teeth, which begin erupting from 6-7 years of age. However, the effect of diet on tooth decay is life long. The impact of diet on oral health begins in the womb and a pregnant woman’s nutrition choices impact tooth development. However, the child’s own diet immediately following eruption of the teeth is much more important. Deciduous (baby) teeth are most susceptible to decay soon after they erupt from 3-6 months of age, as are permanent (adult) teeth, which begin erupting from 6-7 years of age. However, the effect of diet on tooth decay is life long. Older age groups are also at increased risk; mouth dryness, for example, due to lack of saliva (caused by many medications) predisposes to tooth decay. Tooth loss hampers their ability to eat, thrive, and enjoy life. As people are living longer, tooth decay rates are increasing. It is clear that more attention needs to be paid to diet and dental care in our later years. References: * More in-depth recommendations of required food groups and their appropriate proportions based on weight, height, and age, and exercise requirements can be found at the Department of Agriculture’s (USDA) website: www.choosemyplate.gov.